Affordable housing has become scarce in many German cities, where skyrocketing rents are displacing low-income residents to the outskirts. The problem is by no means new though. In the 1970s and 1980s, people in the Federal Republic of Germany took to the barricades to check investors and rent increases, sometimes in rather drastic ways. They occupied empty buildings and waged heated street battles with police. The plight of individuals developed into a national squatters’ movement, which has had a lasting impact on urban planning in Germany. The movement began in the late 1960s in Frankfurt am Main, Germany's financial heart back then as it is today. As in the rest of Germany, people were enjoying the fruits of the Wirtschaftswunder, Germany’s post-war economic miracle, and politicians and urban planners were looking to make the downtown area attractive to investors. Banks, insurance companies and investor groups took a particular interest in Frankfurt's Westend district, an ideal location for offices with easy access to the central train station and the airport. Once the elegant home of the bourgeoisie in the 19th century, Westend had developed into a place where ordinary people lived in post-war Germany. Sitting tenants now stood in the way of development and profit, so landlords decided to force them out by any means necessary. Owners let their buildings fall to rack and ruin, sometimes just by simply ignoring the necessary upkeep and repairs, and sometimes employing actual sabotage. When tenants finally got fed up and moved out, the buildings were cleared for demolition and replaced by commercial and office buildings. The result was an enormous shortage of living space. Threatened by homelessness, some guest workers, families and students moved into buildings that stood vacant but had not yet demolished. These were the very first squats in abandoned buildings in the Federal Republic of Germany in autumn 1970. Though these first squats were born of necessity rather than political conviction, they tapped into the general zeitgeist of the time. The year before, the "Aktiongemeinschaft Westend" (AGW) citizens' initiative had been founded to promote the preservation of historical buildings in the Westend and keep residents from being evicted. Squatting soon became a mode of protest for many. The movement received broad support, not just from left-wing youth and student organisations, but also from churches and trade unions, many members of the press, the middle class, and Frankfurt's guest workers. 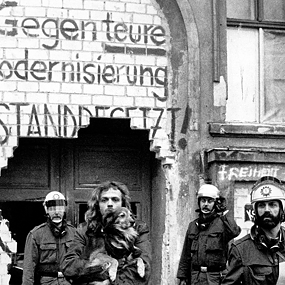 In 1971 police were sent in to clear a squat in Grüneburgweg by force and the first major street battle in the Westend erupted. Many more would follow. An association of left-wing young men armed with clubs and calling themselves the “Putzgruppe” or the “cleaning crew” came in to protect the squatters. One of the most prominent of these fighters who sought direct confrontation with police officers on the street was Joschka Fischer, later leader of the Green Party and Germany’s foreign minister. The events in Frankfurt kicked off a national wave of building occupations. Berlin and later Hamburg became the movement’s strongholds. In the early 1980s, more than 150 houses were occupied in Berlin at some times. The squatter scene there though was not spearheaded by displaced residents. It was more the effort of young leftists who had moved to the city and were pursuing a different agenda. In addition to affordable flats, the first Berlin squatters - a group of students who moved into a house on Oranienburgerstrasse in 1980 - demanded a new way of life and space to live and work as a collective. Squatters often repaired the buildings they occupied in hopes of preventing their demolition, so some referred to themselves as “Instandbesetzer” or “maintenance squatters.” But the peace-loving Berlin Mueslis, literally “the granolas”, were joined by a more radical fraction, the militant Mollis named for their penchant for Molotov cocktails. Mollis were often members of the Autonomous Movement, and Autonome is still a buzzword for members of the violent left-wing scene today. They demanded an all-out war against what they called the “pig system” and deliberately sought violent confrontation with the police. 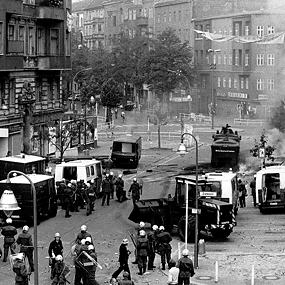 As early as December 1980, the forceful removal of squatters led to the first major street battle in Berlin commonly known as "The Battle on the Fraenkelufer”, which lasted the whole night. In the mid-1980s, the movement reached Hamburg where the Hafenstrasse, the Rote Flora (an alternative cultural centre in a former theatre) and the Schanzenviertel district are still considered strongholds of the left-wing Autonomous Movement today. To avoid allowing "a Berlin situation" - where the Senate often did not dare have occupied houses evacuated for fear of serious resistance – to develop, the Hamburg Senate decided to pursue a 24-hour doctrine and ordered every occupied house to be cleared of squatters within one day. This didn’t prevent frequent escalations of violence though, where hundreds of protesters faced down hundreds of police officers in the streets. Though politicians and police decried them as thugs and notorious troublemakers, squatters in both Berlin and Hamburg had the support of city residents. Lease terminations, luxury renovations and the notorious number of abandoned buildings combined with a shortage of living space also infuriated a lot of ordinary people, and many demonstrations of solidarity from the time bear witness to this support. In December 1986, 12,000 people protested in Hamburg's downtown and demanded the preservation of the Hafenstrasse. Ultimately, the Hamburg squatters came out on top and Hafenstrasse is a legalized housing project today. Many citizens were also deeply disturbed by the police response. Police attacks on innocent bystanders during heated street battles in Berlin in 1980, and the overall brutal treatment of demonstrators kicked off a public debate about the violence used on both sides. The death of squatter Klaus-Jürgen Rattay during a demonstration in 1981 forced politicians to reconsider their approach. The Berlin Senate decided it would be more effective to negotiate with the occupiers rather than use violence against them. 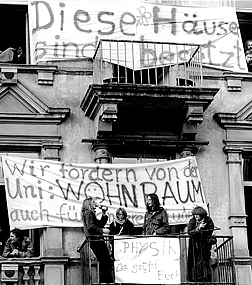 By 1984, most of the occupied houses had been vacated or occupants had received legal tenancy agreements, as in the case of what is the Bethanien artist colony today. In Frankfurt's Westend, the protests led to the preservation of many historical buildings. In 1972, the state government ended land speculation in the Westend and with the help of the AGW, listed buildings were saved from demolition. Above all, however, the actions in the Westend led to a shift in urban planning towards more citizen participation. Even if this can be chalked up as a lasting success, it did not do much to help lower-income residents: for financial reasons, most were eventually forced to move to the cheaper outskirts of Frankfurt. 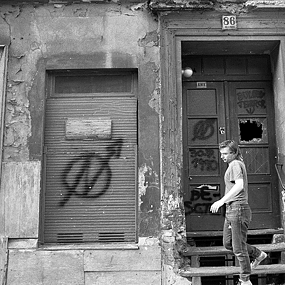 The symbol of the squatter scene was a circle with an N-shaped flash of lightning - seen here on a dilapidated house in Oranienburgerstrasse in East Berlin, taken in the summer of 1990. 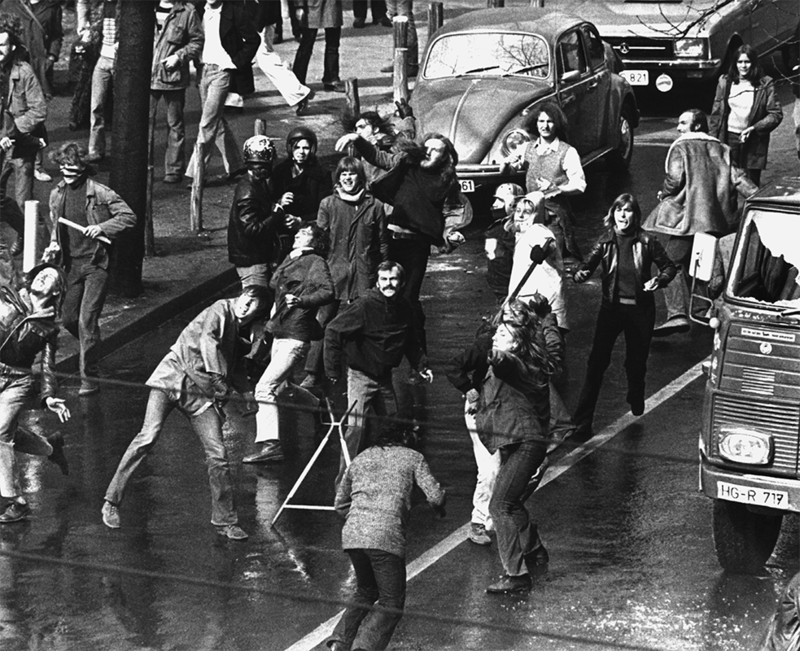 After the forced evacuation of an occupied house was announced, a street battle between police and the participants of a spontaneous demonstration took place in Frankfurt's Westend on March 28, 1973. Demonstrators used sticks and stones to defend themselves against water cannons and tear gas. Also on February 23, 1974, police and demonstrators fought a violent battle on the grounds of the university in Frankfurt am Main. The demonstrators protested against the eviction and the demolition of rented houses in the Westend district of Frankfurt. On November 13, 1979, fifty young people occupied two vacant houses in the Westend district of Frankfurt. A spokesperson for the students emphasized that they wanted to protest against the housing shortage among students. 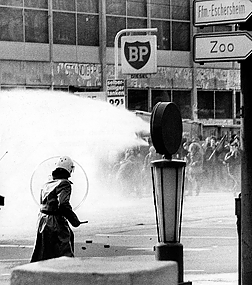 In 1981, squats were cleared in Berlin with a large police tone. In the context of this event, 18-year-old Klaus-Jürgen Rattay was killed by unclear circumstances. The next night there was serious violence between the police on the one hand and the squatters and their sympathizers on the other. Een kraker wordt op 24 maart 1981 naar een politiewagen geleid. 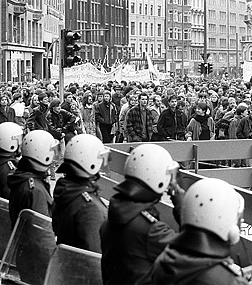 On 20 December 1986, thousands of demonstrators traveled through the center of Hamburg to protest against the demolition of houses in Hafenstraße. 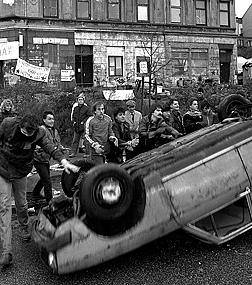 Residents of the Hafenstraße open a street barricade on 18 November 1987. The years of struggle for the preservation of the buildings in the Hafenstraße in Hamburg, inhabited and often squatted by a colorful group of young people, ended on November 19, 1987 in a peaceful way thanks to a lease agreement.